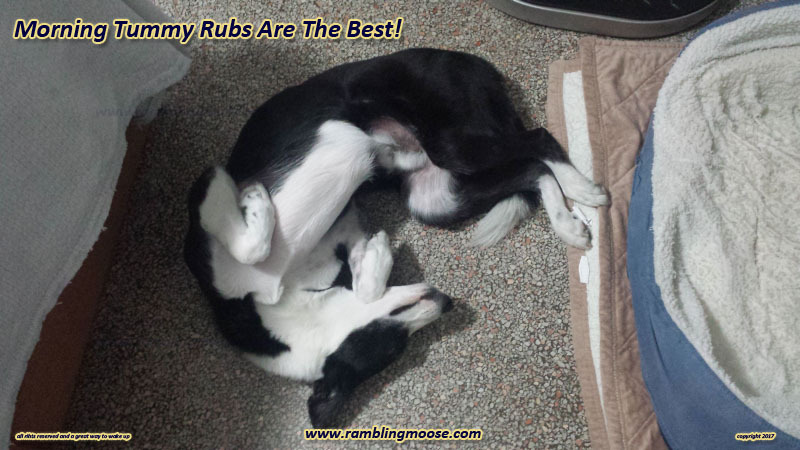 Anyone who has the pleasure of having a McNab Dog in their life knows the position. On their backs, spine curled, one or more legs in the air, exposing their belly for all to see. Nah. Why? It's tummy rub time. Actually in this case, it's an every morning thing. Even before I get out of bed, I am leaning over and rubbing a tummy. The lights then get turned on, and the abbreviated morning routine happens. Coming back into the bedroom, if he gets up, as soon as the door to the bathroom opens, he's back down on the floor preparing to roll back up into his bendy self. 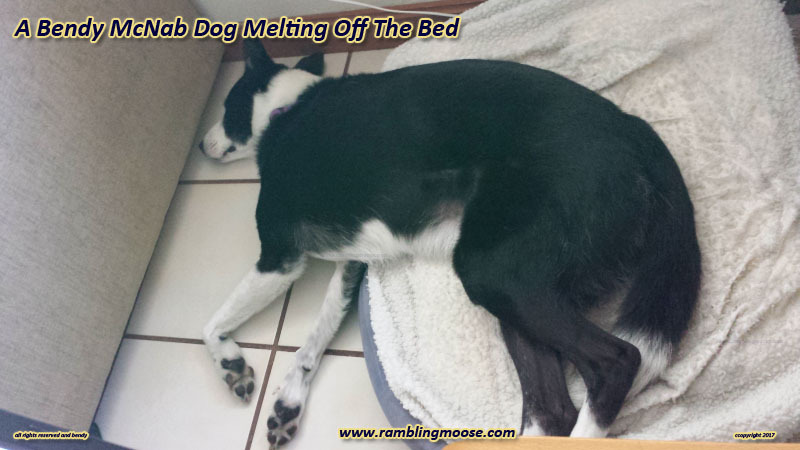 It is a comically common position with Rack, my McNab SuperDog (TM). He does it anywhere he thinks he'll get attention. He has also fallen asleep under my hand while I was rubbing that tummy so I must be doing it right. If he isn't sleeping on his back, he's bent into a dogball with his head on his tail. It isn't that he does that to keep warm, I live in Florida. You know, below the Freeze Line? Boca Raton gets temperatures down to 32. The coldest it has been since I moved here was 34. That's 1C for those Metricated people out there. He will do that in winter, summer, no matter when. If he gets too warm being curled up in his bed, he's going to come out and sprawl out on the Terrazzo floor and curl up there. Bendy Dogs will do that. Comically so. 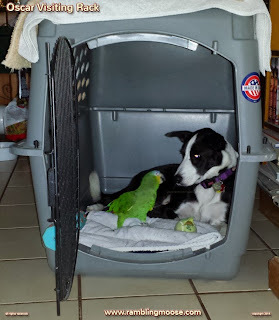 In fact, those of us who follow the breed have decided that our bendy dog is normal, it's a trait, even if he's being visited by a parrot who may want to try to take over his crate. 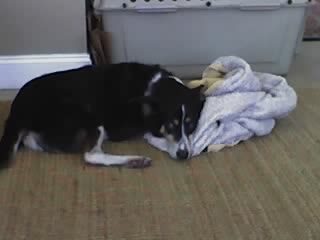 Oh sure, they can flatten out like any other dog. If they act like they are made out of latex, rubber bands, springs, bits of string and other things that stretch and bend, they will sprawl out on the floor. In fact I do believe that they will deflate partially, lowering their internal air pressure by half like I did when I used to take my Jeep off road in the New Jersey Pine Barrens near Chatsworth. So I have an off road dog. Wouldn't be the first. Lettie did it as well. When she got older, she stopped bending so much and would be solar powered, letting her mostly black fur soak up as much sun as possible, recharging her for later. But she used to sleep in a ball just like Rack does. Like I said, it's a breed trait, and an amusing one at that. I guess it is one of those things to watch for. 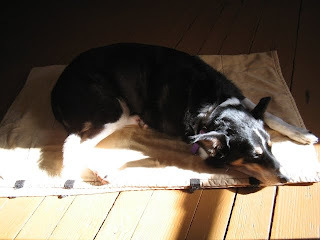 As time goes by, Rack will choose to recharge in the sun, flatten out and stop his bendy ways but I bet he'll always roll up for a tummy rub when it's available. And even when it is not.